I will dispense with the overview and sermon, telling you why these are the sorts of books we sell, what’s important about them, how they mesh with our vision, why you should have reading groups, blah, blah, blah and get right to it.Â They deserve so much more, but I at least want to alert you that they are here.Â Â And offer some special blog pricing. 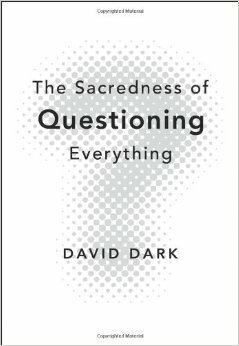 The Sacredness of Questioning EverythingÂ David Dark (Zondervan) $15.99Â I say this sort of thing a lot these days, but that Zondervan would publish a book that quotes Dan Berrigan and Homer Simpson and James Joyce and Rowan Williams and Allen Ginsberg and Walter Brueggemann shows that the apocalypse might be niegh.Â Thanks be to God that such good writers, who read widely, and make such a fabulously interesting cases for important matters, are being published by evangelical houses.Â In this case, the case is that we should think long and hard—indeed, that God wants us to—and that we should in some ways deconstruct the standard fare, coming at us from church, schoool, media, government. What an invitation to a discerning, liberated lifestyle!Â David remains commited to standing on the solid rock of historic orthodox faith and his Buechner-esque Presbyterianism, with Southern shades of Flannery O’Conner, shines through each good section.Â Â Eugene Peterson observes that Dark “brings a deep sense of reverence to every book he reads, every song he hears, every movie he sees, but it is a discerning reverence—attentive to truth and Jesus wherever he comes on them.Â He is also a reliable lie detector.Â And not a dull sentence in the book.”Â I love this guy.Â If you’d like a quick example of his good writing, read this great review of Rod Dreher’s Crunchy Cons that appeared a few years back in The Christian Century.Â Or this ramble on Bob Dylan from Paste. The Furious Longing of GodÂ Brennan Manning (Cook) $16.99Â This brief, almost hand-sized hardback is lovely to behold.Â It is Manning doing his thing again, telling us, once again, that we are loved.Â It is, indeed, a love story for the broken-hearted, an intense and consuming love story.Â For those who feel they can never measure up, this poignant telling of the serious love of God may be surprising: yes, God loves us, he call us His beloved.Â We’re all ragamuffins, and Manning loves to tell stories that reminds us that Christ is with us in our mess.Â Good news, eh?Â Very tender questions for reflection, too.Â To be honest, I wish there was more Biblical groundedness here, and a few more pages.Â But it isn’t that kind of book…use it carefully for meditation or reflection or as a reminder.Â I believe it was C.S Lewis, after all, who said we don’t always need to be instructed, but reminded.Â Yep. Â In this brand new book by Ann Spangler and Lois Tverberg we have a popularized and inspiration devotional study of what it would be like to study in 30 AD with the great Rabbi.It really is wonderful (and draws on Baily, in fact. )Â Marvin Wilson, who we surely trust on these themes, says that these authors “vibrantly introduce the reader to valuable aspects of the Jewish back- ground, lifestyle, and teaching of the Rabbi from Galilee.” . Christian Worship: 100,000 Sundays of Symbols and RitualsÂ Gail Ramshaw (Fortress) $30.00Â You may know Ramshaw as a thoughtful Lutheran feminist theologian and liturgist.Â Her husband is the Lutheran scholar of liturgical theology, Gordon Lathrop, whose own work is considerable.Â Here, in this new hardback, illustrated with photos, icons and artwork, she offers a very creative ecumenical textbook on worship.Â It is being said that there is nothing like this on the market, an exciting and engaging text—“marked by ample wit” one reviewer says—and written for serious, introductory study.Â There are some very, very interesting questions at the end of each section, her own reflections and proposals, which help readers live out the meaning of true worship.Â She spends some time looking at mythic power and the role of ritual, and makes an important case for knowing the past, the symbols, the liturgy.Â Fascinating. BeatitudesÂ Jeff Cook (Zondervan) $12.99Â This isn’t brand new, but I’ve waited until Lent to start it.Â Wow, what an amazing writer!Â What a great way to tell the story, what an authentic voice–penned by a evangelical church-planter in a boozy college town in Colorado.Â I’m really, really impressed and with all the many books on the seven deadlies, this is surely the most interesting and, if I may say so, fun to read. Â It is an important trope, too, to match up the seven deadly sins and the beatitudes;Â it isn’t original with him, but he may be the one who plumbs it best without being overly wooden or didactic. Gardening Eden: How Creation Care Will Change Your Faith, Your Life, and Our WorldÂ Michael AbbateÂ (Waterbrook) $13.99Â Before the snake, the fruit, the fall, the Commandments, God created a garden.Â And Abbate is in fact, a gardener.Â We all are, he says, as God has given us the immense obligation to work the garden well, to cultivate and care for the planet.Â Interestingly, Mr. Abbate is a nationally recognized expert in green development strategies, is certified LEED and ASLA, and runs GreenWorks which is an award-winning landscape architecture design firm.Â It is fabulous to have an evangelical publisher feature the work of an urban design leader, who writes also for trade journals and national magazines.Â Randy Alcorn wrote the forward.Â Is this the first evangelical book that quotes Michael Pollen (in a section on eating locally? )Â Thank goodness for his wide reading—from Francis Schaeffer to Wendell Berry to the West Virginia Council of Churches (see their statement on mountaintop removal.) Very, very readable, with tons of practical up to date tips for faithful creation care. Man, I better get some of these books before the economy completely collapses and they take my book allowance away. Great selections, Byron. I’ll put in an order shortly.